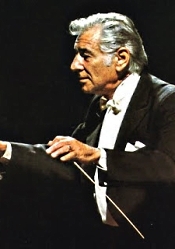 Leonard Bernstein, Orchestre National de France. Hi-Q Records HIQXRCD14. 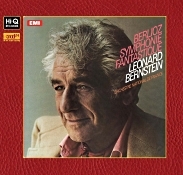 Before we begin, I have to admit this EMI recording by Leonard Bernstein and the French National Orchestra of Berlioz’s Symphonie fantastique is not my absolute favorite performance. That honor goes to Sir Thomas Beecham and the French National Radio Orchestra, recorded some years earlier, also for EMI. However, the good news is that Bernstein’s rendition is my second-favorite performance, so even though it sightly miffs me that the audiophile label Hi-Q didn’t remaster the Beecham, I’m still glad they choose the Bernstein. They could have done worse. French composer Hector Berlioz (1803-1869) wrote the Symphonie fantastique in 1830, and it didn’t take long to become one of the most influential pieces of music of all time. With programmatic elements similar to earlier works like Vivaldi’s Four Seasons and Beethoven’s Pastoral Symphony and using a huge orchestral arrangement for well over a hundred players (I’ve read that Berlioz employed about 130 musicians for the première), the result must have been extraordinary for its time. Nevertheless, it’s not really a traditional symphony; it’s more like a psychodrama in five movements, wherein the young Berlioz writes autobiographically of the hopeless love of a young man for a woman, the young man falling into a drug-induced dream, which the composer describes in his music. The woman reappears throughout the Symphonie in the form of an idée fixe, a “fixed idea” the young man cannot shake, a musical innovation Berlioz used to advantage and one that later composers like Richard Wagner used extensively. In any case, Maestro Bernstein approaches the score with a sympathetic dynamism, an understanding that Berlioz was something of a wild man of music, mercurial and capricious. As these qualities underscore many of Bernstein’s own early recordings, the conductor and composer would seem to be a perfect match for one another. Some listeners, however, might prefer a more straightforward account of the music and for them I would recommend Sir Colin Davis (Philips or PentaTone), while other people might want a less-vigorous and more-atmospheric interpretation, and for them I would suggest the aforementioned Beecham. Meanwhile, we have Bernstein to consider. Berlioz called the opening movement Reveries--Passions, describing the dejected romantic lover of the score conjuring up opium dreams and nightmares of his lost love. Bernstein's "Reveries" are more passionate than many conductors', yet for all their vigor by the close they still convey a strong spiritual conviction. The second movement describes a ball in which the young man catches a flash of his beloved. This scene also benefits from Bernstein's emphasis on the music's contrasts. Without distorting the music, the conductor playfully captures all the shimmer and seduction of the dance and the hero's brief, tantalizing glimpse of his loved one. After that is the scene in the country, a long, slow Adagio. In it, the young man sees a pair of shepherds playing a pipe melody to call their flock, and all is well until, as always, the young man notices his love in the picture, and the music takes a sudden turn. Here, Bernstein manages to make the music more attractive than some conductors do, never allowing it to drag or wallow in too much sentiment while still maintaining its nostalgic, melancholy tone. Finally, we come to the two movements that audiophiles love most because they bubble over with so much busy, vigorous energy and orchestral flourish. They’re ideal for showing off one’s audio system, and what better way to do it than with an audiophile remaster. The March to the Scaffold brings the young man to his death for the murder of his beloved, and the Witches’ Sabbath finds the poor fellow at Judgment Day in hell. Bernstein generates some genuine electricity in these movements. His depiction of the hero's long green mile to the blade is deeply moving rather than jaunty or comical; moreover, he produces the most-terrifying vision of hell of any conductor I've heard. This Witches' Sabbath is downright scary. The bells! The bells! The Hi-Q packaging is deluxe, too, the disc housed in a glossy, heavy-duty Digipak-type case, with booklet notes bound to the inside and the disc to the back cover. EMI producer John Mordler and engineer Paul Vavasseur recorded the music at the Salle Wagram, Paris in November, 1976. Hi-Q Records, Resonance Recordings Limited, and JVC remastered and rereleased the audiophile edition of the album in 2013, using JVC’s XRCD/K2 processing system. Having the original EMI CD on hand for comparison helped in determining the sonic improvements in the Hi-Q product. From my listening, the Hi-Q appeared more vivid, with a wider dynamic range and stronger transient impact. Those are among the qualities we generally associate with audiophile remasters, and the remaster comes closer to what one presumes is the sound of the master tape. Of course, without the master tape on hand for comparison, it's impossible to know which transfer is most accurate, but it's clear which version sounds best in the end. In this case, that would be the Hi-Q. Then the Hi-Q adds in a tighter bass, greater detail, and a smoother overall response to solidify further its dominance. Indeed, the Hi-Q disc makes the regular EMI issue sound almost dull. I'm not entirely sure one could identify these differences with only the Hi-Q disc playing, but in a direct, side-by-side comparison they are clearly audible. Interestingly, neither version displays the best orchestral depth or midrange transparency, further conditions of the master tape, no doubt.